Reader Pam is looking for a way to "clean out duplicate files, documents, pictures, etc.," but doesn't want to spend money on the project. In other words, she wants a freeware solution. I've got just the thing: Fast Duplicate File Finder. True to its name, the utility scans selected folders on your hard drive, finds duplicate files, then gives you the option of tossing the copies into the trash. Also true to its name: it's fast. My colleague Preston Gralla wrote up FDFF earlier this year, so I won't repeat his fairly glowing review of the program. I will say that I tried it myself on my large and unruly MP3 collection, and it found some duplicates I didn't even know were there. 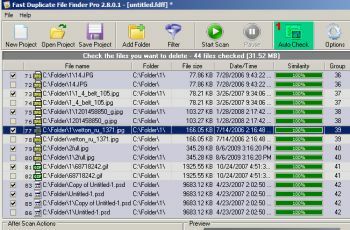 And I liked the various after-scan options the program affords, like automatically selecting the older versions of duplicate files and moving or deleting checked files. In other words, FDFF is a smart, useful utility that works as advertised--and you can't beat the price. Sound good, Pam?